Beautiful photographs! Love the botanical print. Thank you for hosting! Thank you for hosting Mary. Love the pictures especially the shadowing on them. 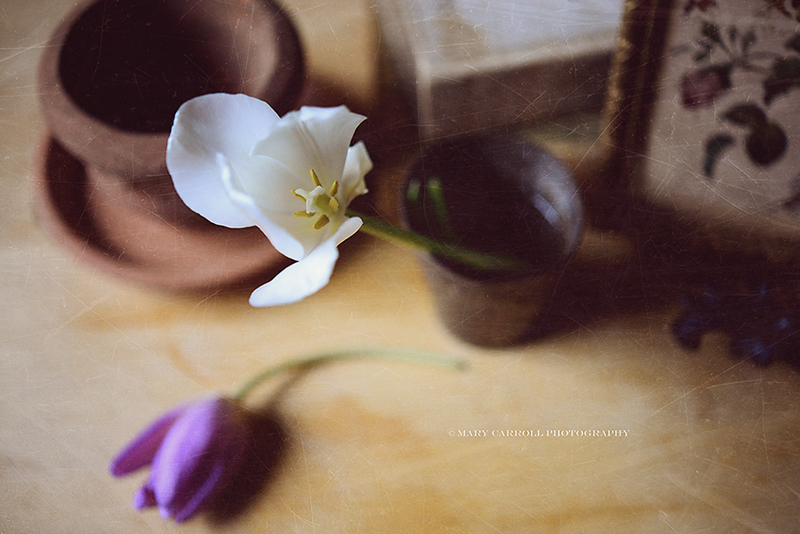 I look at all the tulips petals that have fallen from my bouquet and I think of how you could create beautiful photos with them, Mary. Pretty Spring inspired mosaic ! Thanks for hosting again this week. 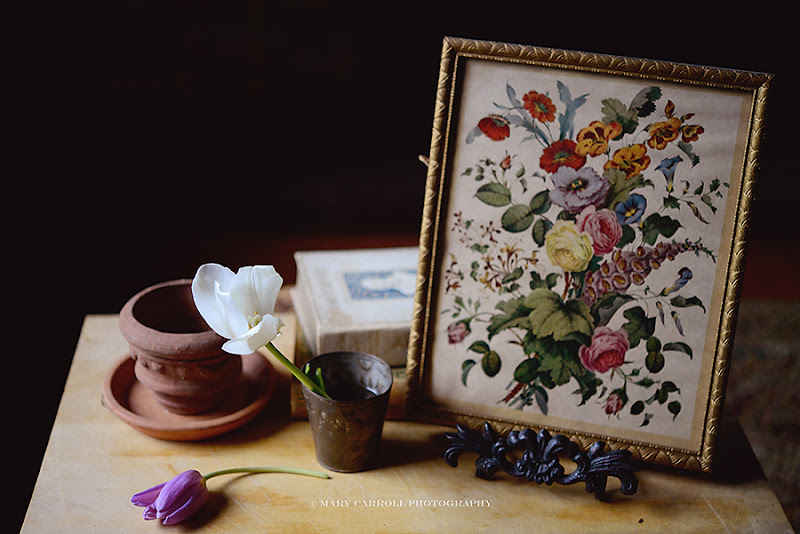 Love your spring is getting closer vignettes. Thank you for hosting, it is always a pleasure to join in. Have a great week. To take a tulip that is past its prime and make it useful for a photo shows that you see the beauty in flowers even in this state. I feel bad now that I toss them when the petals start to drop. You'd love the vintage gardening tools, catalogues, seed packets etc. that a gardening associate has in a special shed in his backyard. I think I posted about it once and just love looking at all the things he has accumulated over the years. It's not a great big potting table? Oh my! You had me totally fooled. Elsie Dinsmore...have some of those...should crack it open and see what it's about...sweet graphic. There's something so totally dreamy and lovely about this week's mosaic. It definitely isn't pedestrian! Oh mine didn't link...will try later. Silly me...guess it looks too different for me! Old books plus flowers plus gardening implements - you create the most intriguing still lifes, Mary. I love looking at your compositions. I'll echo Vee - dreamy and lovely. Very lovely photos! The old book is my favorite. Lovely mosaics and photos. 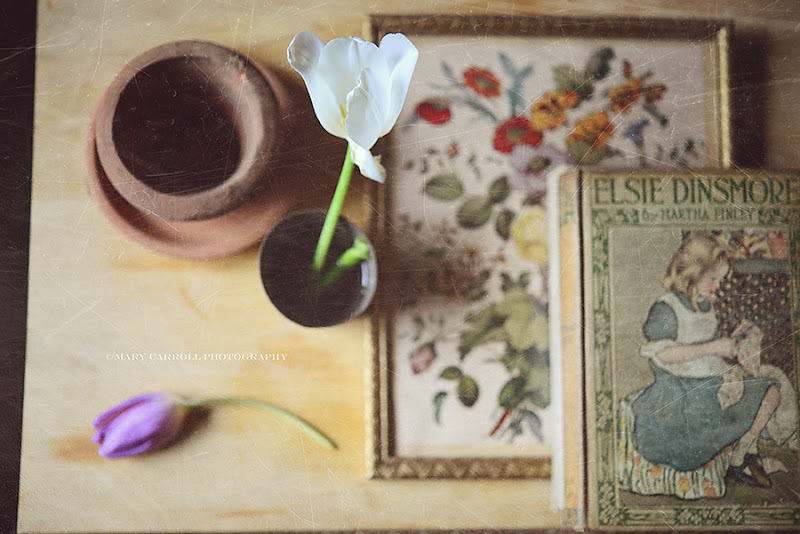 I love the flower petals and the vintage book. I am so ready for spring, warmer days and seeing flowers in my yard. Thanks for hosting, Mary! Have a happy week! I love your mosaics today! Isn't that old book sweet! Happy Monday! Mary, I have joined you all for Mosaic Monday! Such lovely photos for us all to view! Thank you so very much! I need to experiment more with texture. Your images are beautiful, Mary. delightful - they reminisce of another more gentler time where ladies sat and read and did embroidery or flower arranging. Thank you for taking us there. Yes I can see you are looking forward to spring. Have a wonderful week and thank you again for hosting Mosaic Monday. Yes, I can tell and so am I watching for spring! Beautiful photos. Thanks for hosting. The link up looks very different this week, Mary? Did Mr Linky change the way they display the links? I love your vintage flower print. It's a beautful arrangement and the colors are so prety. How I love your vintage display. 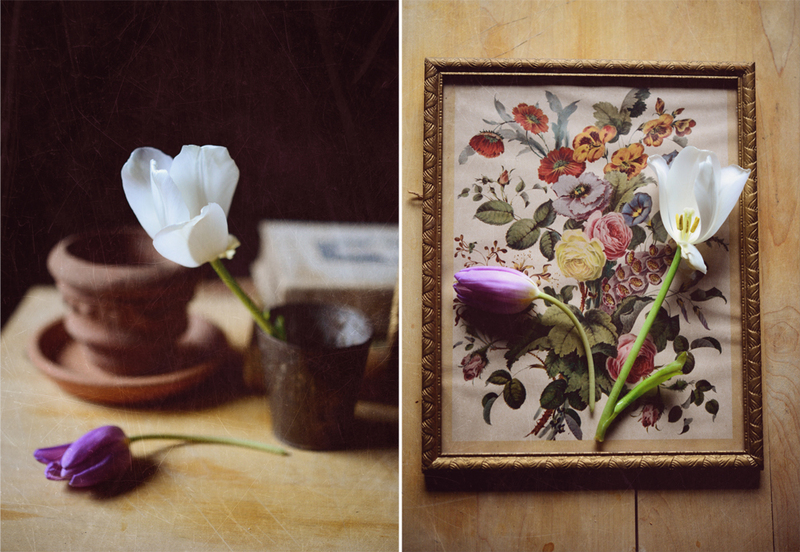 Old books, little tin cups, tulips...Just a few of my favorite things. Thank you for sharing and for hosting. A beautiful collage Mary and I love all your gardening props. I would love to pick up that book, it has such a pretty cover and I can imagine it would be a gentle read. Thank you again for hosting "Mosaic Monday" I look forward to it every week! Absolutely adore this party every week. I think we all are so anxious for spring. Your images are so beautiful. Your pictures are wonderful! You always have the perfect composition for your still lifes. 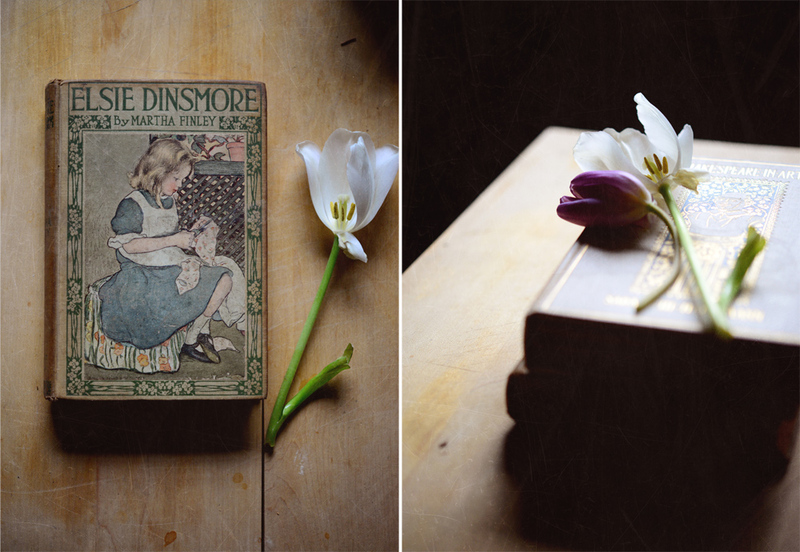 Your photos are so beautiful and I ADORE that old sweet book! Do have a blessed and wonderful week! This is the post, the very post that says so much . Today's post made me remember all those years ago when you were going to work on your photography. If you have time with a cup of tea browse your old photos through your blog and see how amazing you have become. We all in the Land of Blog take photos and have learned tricks. And then there is you. This post is it for me...the one that says you have taken your style, eye for composition, technique, your brand, your love behind the lens and it has exploded into such beauty. I hope that you put one of these gorgeous photos on Society6. I adored how that throw pillow looked on Facebook. Oooh, maybe lots of your fans don't know about your amazing pillow designs. That would be a fun thing to share on a mosaic monday. Can you imagine several of these in throw pillows for Spring? What's this I hear about pillow designs? I'm interested! As always, your mosaics and photography are lovely! I love the combination of old books with stems of flowers. Very nice! Thank you for the beautiful party!